Since 1959, the Grammy Awards, presented by The Recording Academy, have been recognizing musicians from various genres for their accomplishments that year. As with any award show, there always have been and always will be disagreements among musicians and fans about who should have won a particular award. 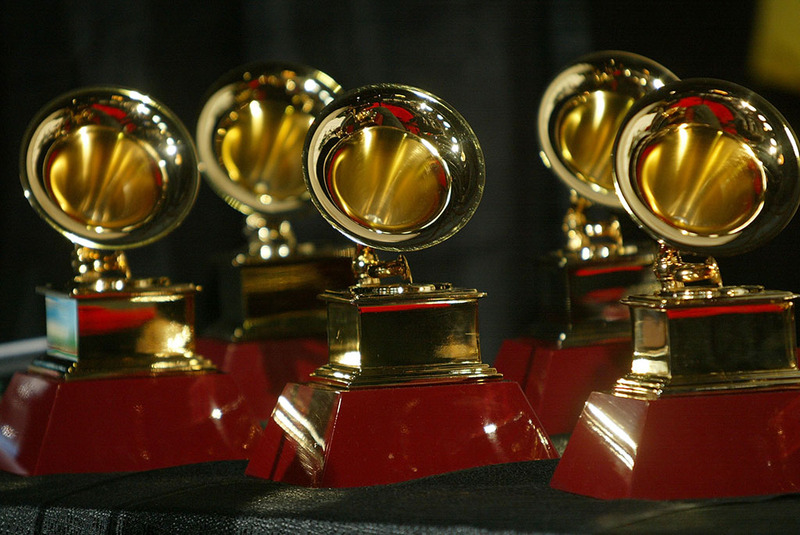 However, the Grammy Awards are also a breeding ground for some of the most awkward, shocking, and downright strange moments in the music industry. Read on to see some of the most notable throughout the history of the award show and decided for yourself which is the most bizarre. 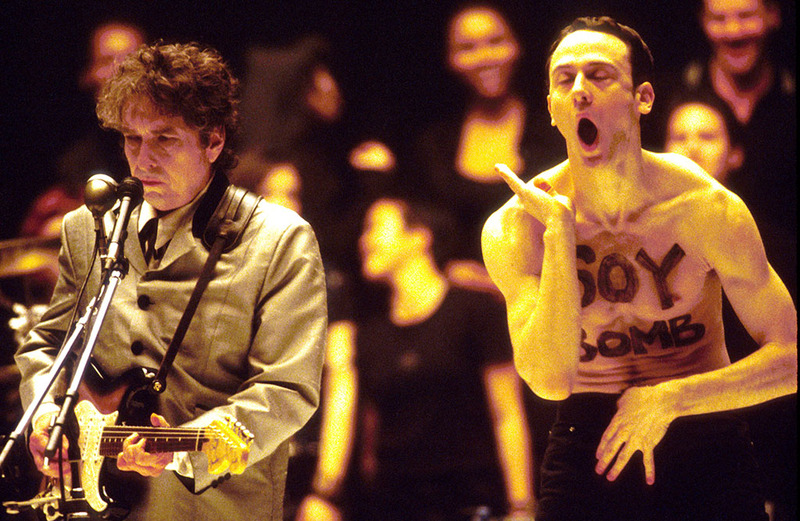 At the 1998 Grammys, performance artist Michael Portnoy was hired as a background dancer during Bob Dylan’s rendition of his song "Love Sick." While he was supposed to just sort of dance in the background, it was clear that Portnoy had different plans. Once on stage, he jumped to the front and took off his shirt, revealing the words "Soy Bomb" written on his chest. He then began flailing his arms around until he was finally removed by security, to the relief of a now-annoyed Dylan. 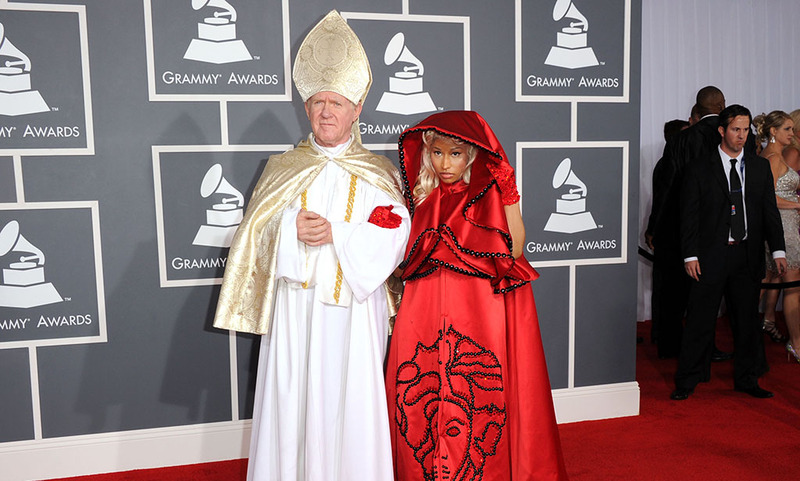 In 2012, Nicky Minaj shocked audiences and the Catholic church when she arrived on the red carpet at the Grammys with an older man dressed up as the Pope for her date. Unsurprisingly, the church had something to say about Minaj’s date’s outfit, although there wasn’t really much that they could do about it. But it only got worse as her performance of "Roman Holiday" featured yet another man dressed up as a priest performing an exorcism on somebody. 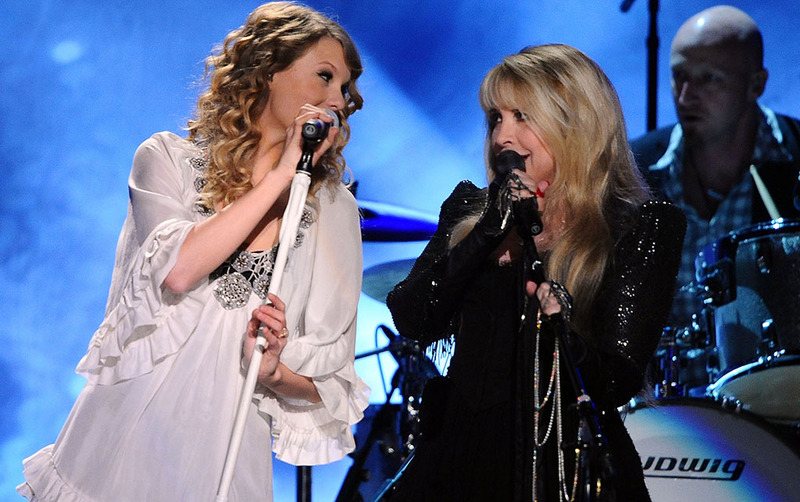 At the 2010 Grammys, Taylor Swift had the honor of performing the song "Rhiannon" with the legendary Stevie Nicks. While everyone had high hopes for the performances, things didn’t pan out as expected when a technical issue led to Swift’s performance turning out incredibly underwhelming. Of course, she was ridiculed and mocked by bloggers and journalists, with the Washington Post describing her performance as "off-key caterwauling." Taylor fought back at the insults and wrote the song "Mean" about all her haters. In 2004, rapper 50 Cent lost out on the Best New Artist category to the rock band Evanescence. To demonstrate his disapproval of the results, he silently walked across the stage while the band delivered their acceptance speech. 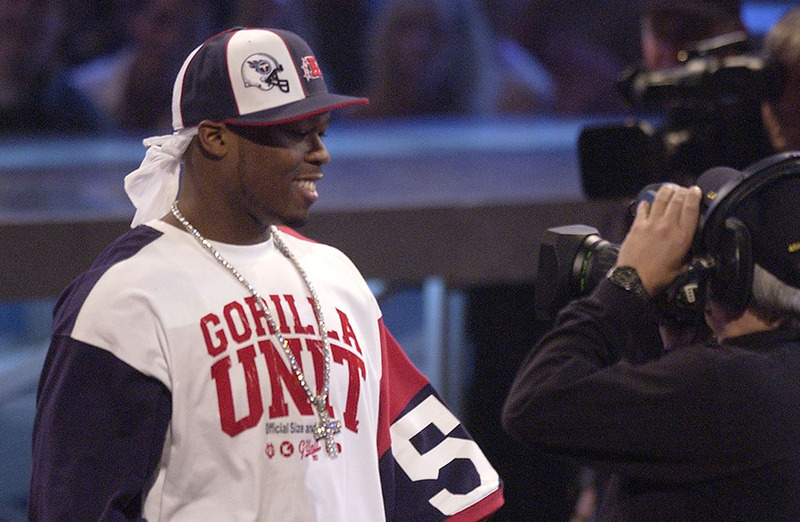 It was an all-around awkward moment for both parties as well as the entire audience, with the majority of people saying that 50 Cent should have acted more maturely in the situation. However, he certainly didn’t lose any fans, as most of his supporters felt that he had been robbed of the award. Just weeks before the 2013 Grammys, R&B singer Frank Ocean got into a physical altercation with Chris Brown. Even after the dust had settled, it was clear that the two of them were not friends. This was proven to be true after Frank Ocean won for the Best Urban Contemporary album for his album Channel Orange. He received a standing ovation from the audience except for Chris Brown who remained seating and pouting like a little boy. 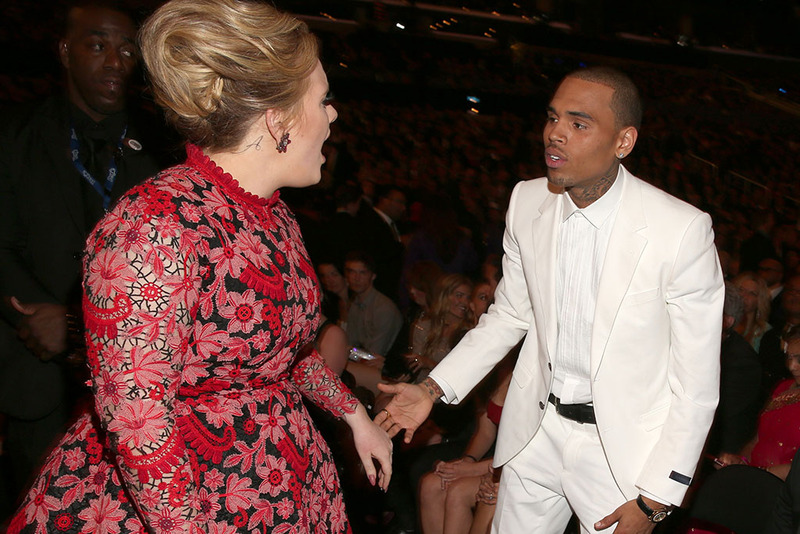 It then looked like he got an earful from Adele for his behavior. In 1998, Wu-Tang Clan’s O.D.B. 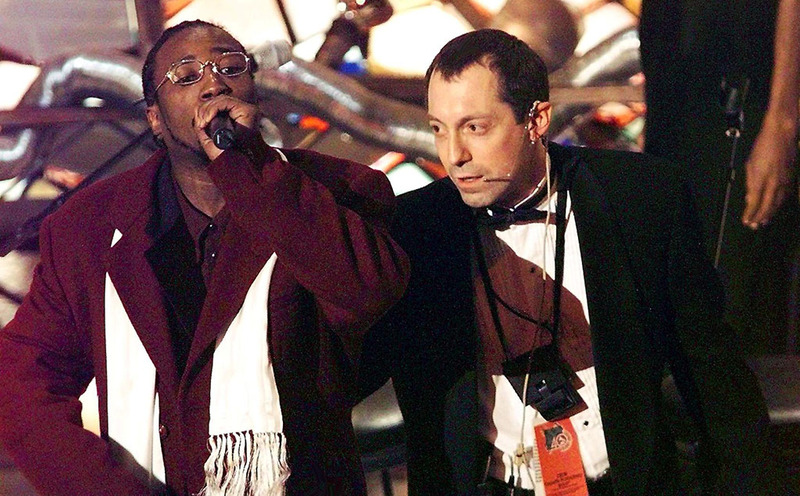 stormed onto the stage during Puff Daddy’s acceptance speech for Best Rap Album. He then went on a rant about how the Wu-Tang Clan is the best and that they should have won the award. He continued on, saying, "I went and bought me an outfit today that cost me a lot of money because I figured that Wu-Tang was gonna win," he said. "Wu-Tang is for the children. We teach the children. Puffy is good, but Wu-Tang is the best." 1998 was the first year that the Grammys recognized Hard Rock/Heavy Metal as its own category, and it was also the most controversial. 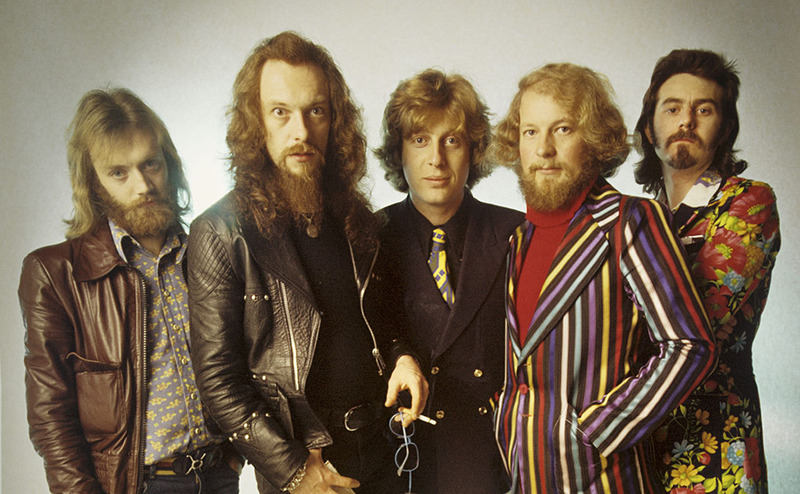 Showing that the voting members on the Academy had no real knowledge of the genre, Jethro Tull won the category for their track "Crest of a Knave" over Metallica’s "And Justice For All." For many people, this just simply didn’t make sense and even stunned Alice Cooper and Lita Ford, who were presenting the award. Although this was a major issue at first, both bands later laughed about it years later. When they won Best Pop Duo in 2017, the pair stripped down to their boxers before accepting their award on stage. Supposedly, they were paying tribute to all the years that they would watch the Grammys together in their boxers dreaming of winning an award themselves. While they may have been making a public joke by stripping down to their underwear, their speech was surprising heartfelt which caught a lot of people off-guard. It showed how thankful they truly were and how hard they had worked to get there. Pantsless. 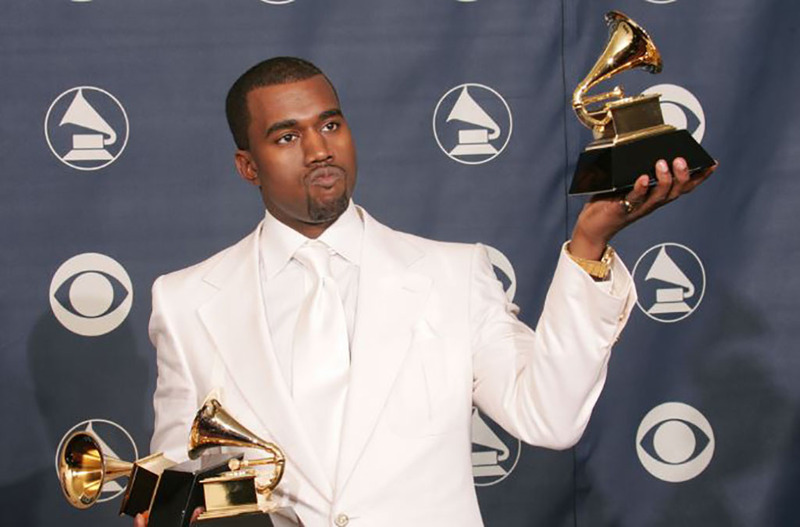 Back in 2005 when Kanye West released (arguably) his best work to date in The College Dropout, The Recording Academy nominated him for Best Rap Album. West was still the outspoken character that we know him to be today, so the audience was wary that he might lash out if he didn’t win. Sure enough, The College Dropout took home the award and the speech is what everyone remembered. "I know everybody asked me the question ‘what’s Kan gon do… I know he’s going to wild out or do something crazy,’" said Kanye. "Everybody wanted to know what I’d do if I didn’t win. I guess we’ll never know." 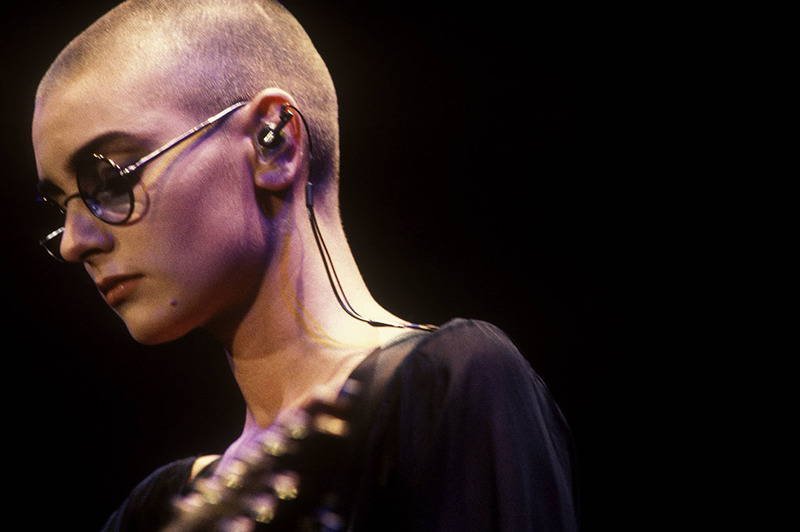 In 1990, singer Sinead O’Connor received four Grammy nominations. However, unlike most other artists, she asked for her name to be removed from the list and that her nominations go to someone else. She then proceeded to boycott the awards and refused her Best Alternative Music Performance trophy for her song "I Do Not Want What I Haven’t Got." She claims that the reason behind her actions was that she didn’t believe in the commercialism of the awards and what they stood for. Their performance at the 2004 Grammys got off on the wrong foot when Jack Black introduced the band as a disembodied head on the screen. 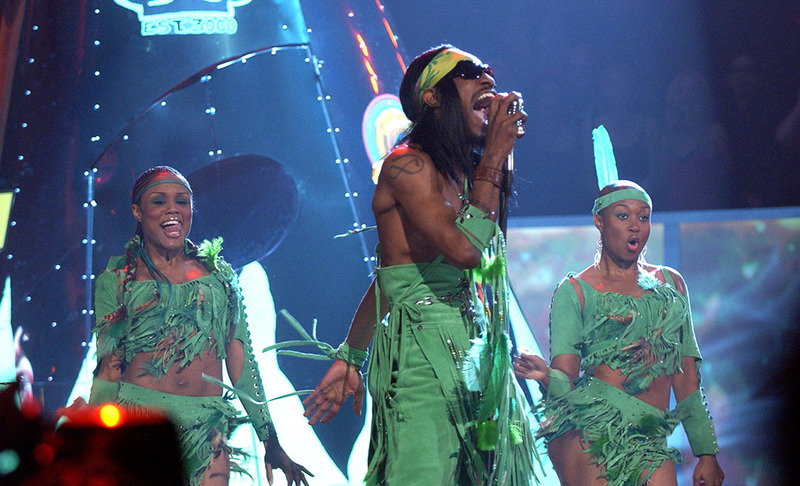 While that may have been weird but forgivable, OutKast then emerged from a teepee dressed as Native Americans. They then proceeded to give a cringe-worthy performance of their popular song "Hey Ya." Altogether, there was just too much cultural appropriation going on to be ignored and the performance was described as not only being underwhelming but nothing short of racist. 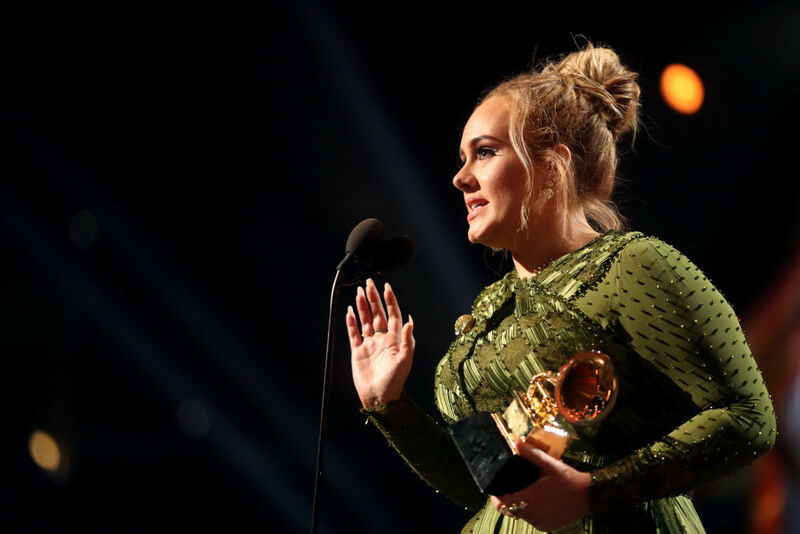 In 2017, singer Adele had quite the successful evening at the Grammys. She managed to take home awards for Song of the Year, Record of the Year, and even Album of the Year. Yet, during her acceptance speech for Album of the Year, she made it very clear that she thought Beyoncé deserved the award more than herself. She went on to say, "All us artists here, we [explitive] adore you. You are our light," showing that even if the Queen might occasionally lose, she never actually does. 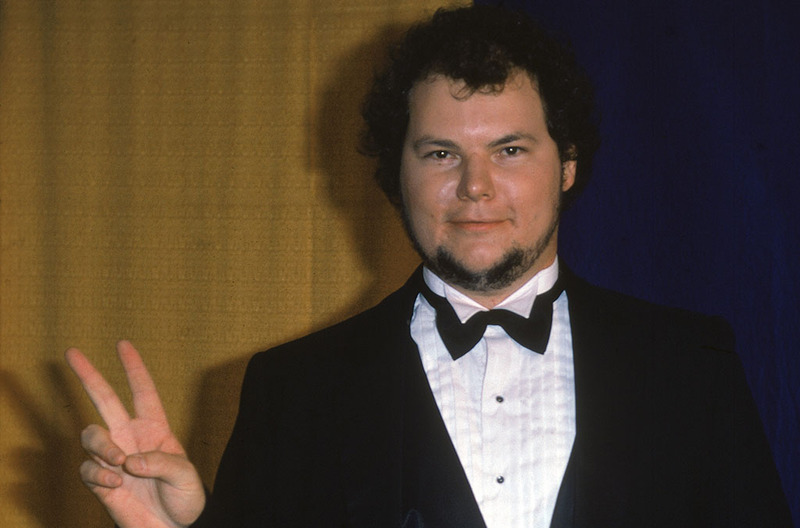 Christopher Cross really made a name for himself at the 1981 Grammys. That year, the relatively unknown Cross beat out Barbra Streisand, Bette Midler, Kenny Rogers, and Frank Sinatra for both Record of the Year and Song of the Year. On top of that, his self-titled debut album also beat Pink Floyd, Sinatra, Streisand, and Billy Joel for Album of the Year. Many people were outraged by his sudden success, yet it didn’t last long as Cross soon fell off the pop radar after the introduction of MTV and music videos. 2013 saw a future Pulitzer Prize winner in Kendrick Lamar, pitted against an artist whom many consider more pop than rap in the Best Rap Album category. The former was up for his brilliant storytelling piece, Good Kid, M.A.A.D City. Not to mention Drake, Jay-Z, and Kanye West were also in contention. However, much to everyone’s surprise, Macklemore ended up taking home the award. Shocked, he sent a text to Lamar after the show and said Lamar should have gone home with the prize. "That text surprised me, but Macklemore is a genuine dude," the Good Kid, M.A.A.D City album nominee said a couple of weeks after the Grammys. The Best New Artist category in 2012 had a list of strong candidates. Nearly all of them had a strong argument to win that award (The Band Perry, J. Cole, Nicki Minaj, Skrillex, and Bon Iver). 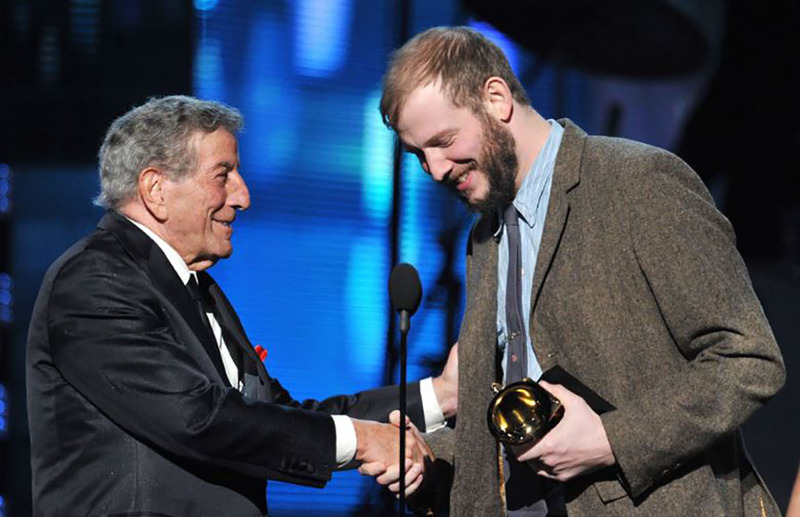 In the end, Bon Iver was the victor, but he didn’t seem too enthused. "It’s really hard to accept this award," he said. "There’s a lot of talent that’s not here tonight. It’s also hard to accept because you know, when I started to make songs I did it for the inherent reward of making songs, so I’m a little bit uncomfortable up here." The category of Best New Artist has always been highly controversial with past losers including Led Zeppelin, Jefferson Airplane, Elton John, Elvis Costello, and many more. 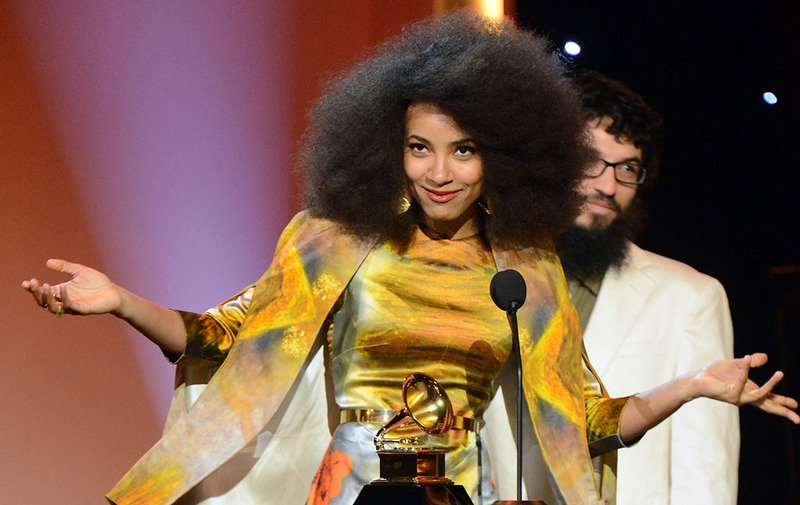 So, in 2011, although it was an upset, it wasn’t necessarily a total surprise when jazz musician Esperanza Spalding won the category of Best New Artists. She was the first jazz musician to ever do so, however, she greatly angered the fans of artists such as Drake, Justin Bieber, Florence + The Machine, and Mumford & Sons, who all lost to her. She even was threatened by some of Bieber’s fans although responded that she was just as surprised as them. In 2001, after releasing her album I Am Shelby Lynne the previous year, Lynne was nominated for the category of Best New Artists. The only problem was that this was her sixth full-length studio album, not exactly qualifying her as a new artist. In the end, she won the category over newcomer Brad Paisley, who would go on to have a much more successful career than Lynne. While giving her acceptance speech she even noted how bizarre the situation was, stating, “13 years and 6 albums to get here.” Nobody still knows what happened to this day. 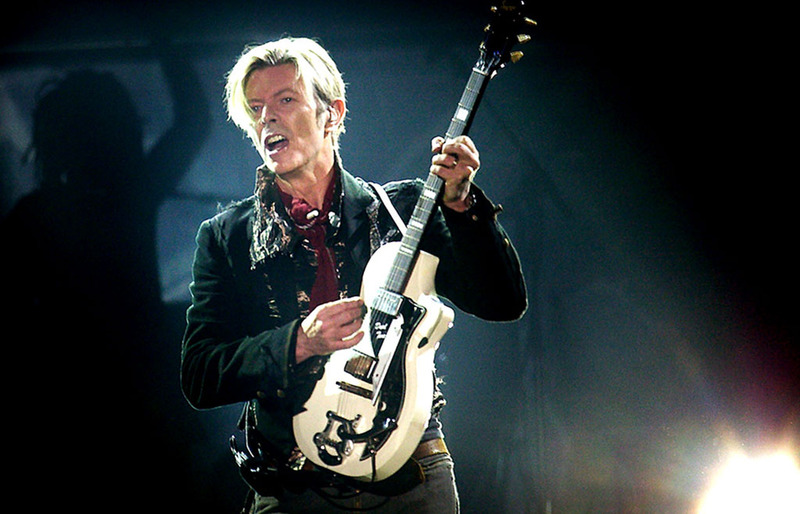 Well before his unfortunate death, David Bowie was considered to be one of the most influential and successful musicians of all time. Yet, for some reason, he never won a Grammy during his musical career except for a Lifetime Achievement Award in 1985 and Best Short Form Video for Jazzin’ For Blue Jeans. However, in 2017, a year after his death, he won five Grammys for his album Blackstar. The awards included Best Rock Performance, Best Rock Song, Best Alternative Music Album, Best Best Engineered Album, and Best Recording Package. In 1990, for the first time ever, an artist was stripped of their Grammy award. 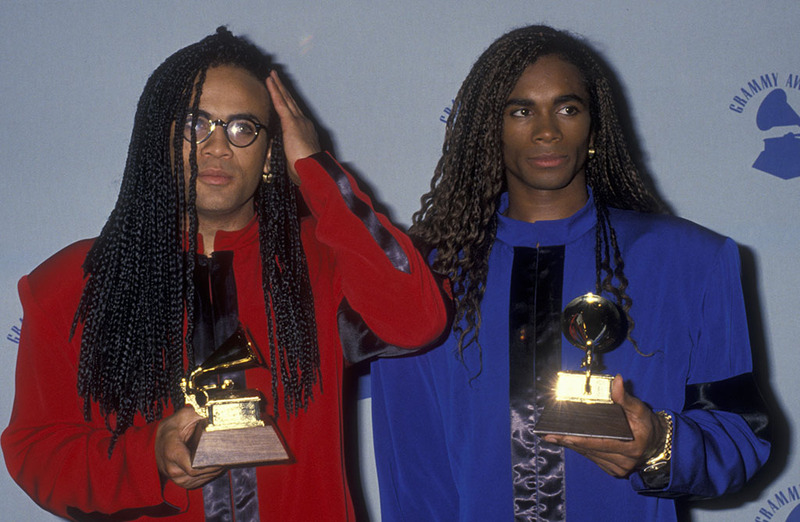 German R&B duo Milli Vanilli had their Best New Artist award revoked after it was discovered that the two performers, Robert Pilatus, and Fabrice Morvan, didn’t actually perform on their album Girl You Know It’s True. Mike Greene, the president of the Recording Academy, released a statement saying “I hope this action signals loudly and clearly to producers, record companies, and packagers that the Academy cares deeply about this issue.” It appears that the message was heard loud and clear as there haven’t been any similar issues since. A Surprising Appearance By A Pregnant M.I.A. Four of the greatest musicians to ever pick up a mic ( Jay-Z, T.I., Kanye West, and Lil Wayne) teamed up for the anthem “Swagga Like Us” which featured up-and-coming star M.I.A. The song earned a nomination for Best Rap Performance By A Duo Or Group and they also performed at the awards show.